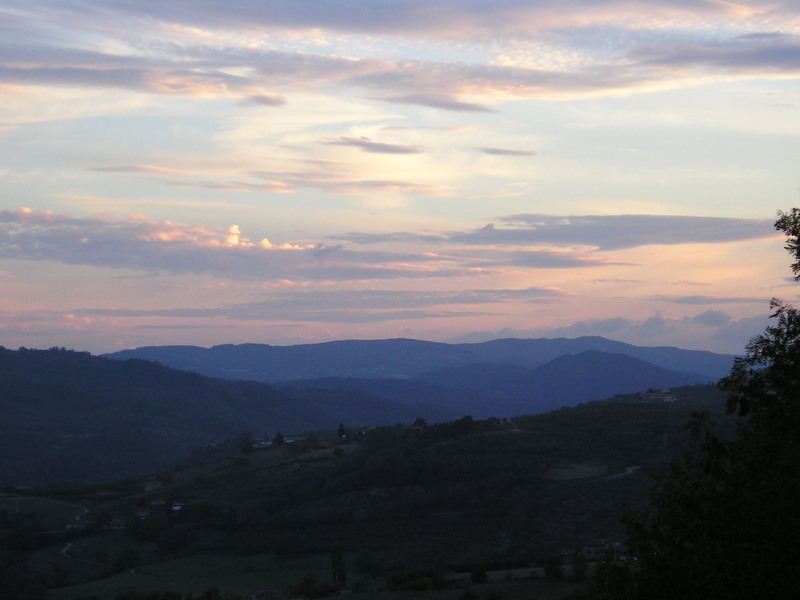 Over the last few weeks – in our “other life” travelling with young Americans through Europe – we have criss-crossed the continent from Nice to Dublin, Rome to Budapest, Athens to Paris. 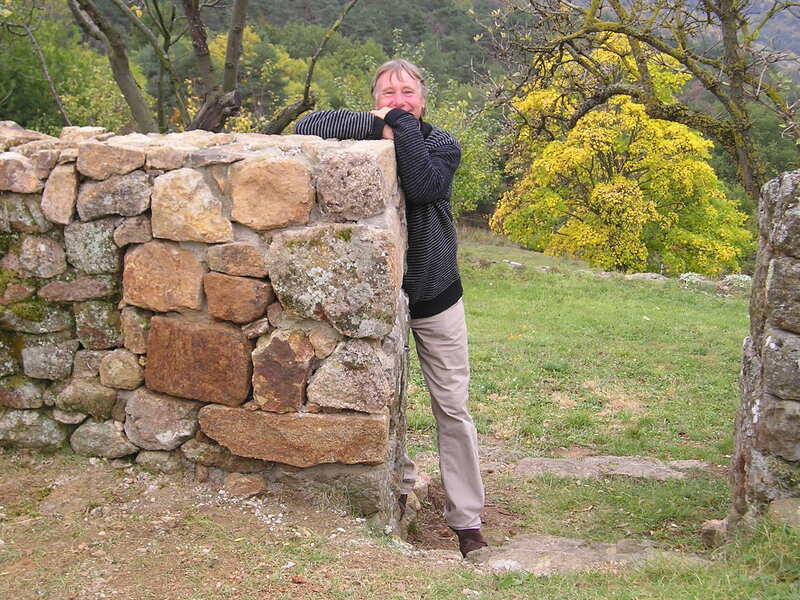 During my travels I attuned my eyes to look more closely at the dry stone walls which divide the European countryside or retain terraces. 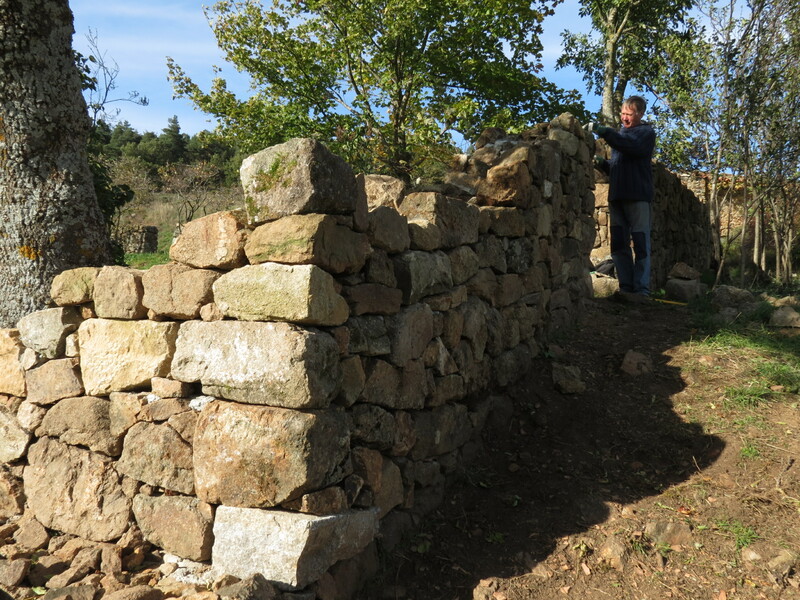 This is all in the hope that it will give me some inspiration for the reconstruction of our garden wall at Les Sarziers. 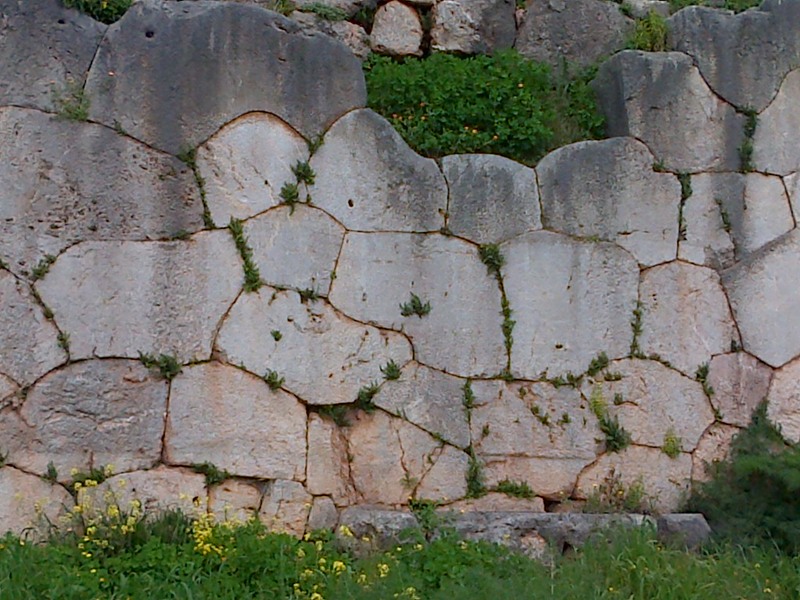 Here is the ultimate craftmanship of wall building at Delphi, the Polygonal wall of 548 BC. As Arlebosc is far from being the navel of the universe, this wall would look a bit out of place. 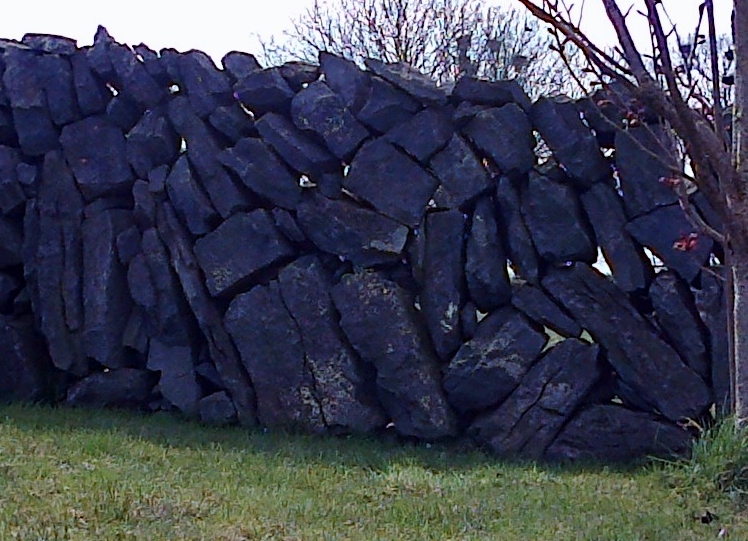 Maybe the type of wall seen in Ireland (below) would do better for our garden. 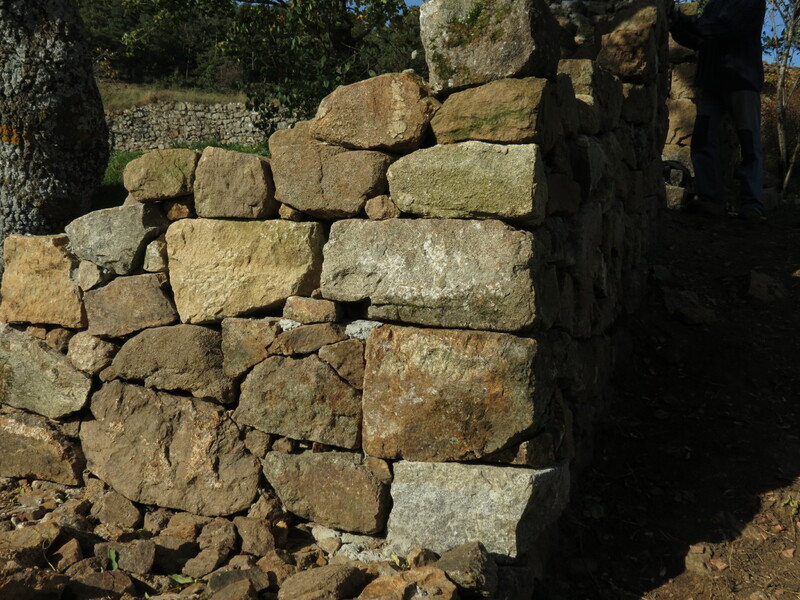 The gaps are there to avoid the wall being blown over by gusts of wind, or – as the locals say – to allow the cows to check that the grass is not greener on the other side. 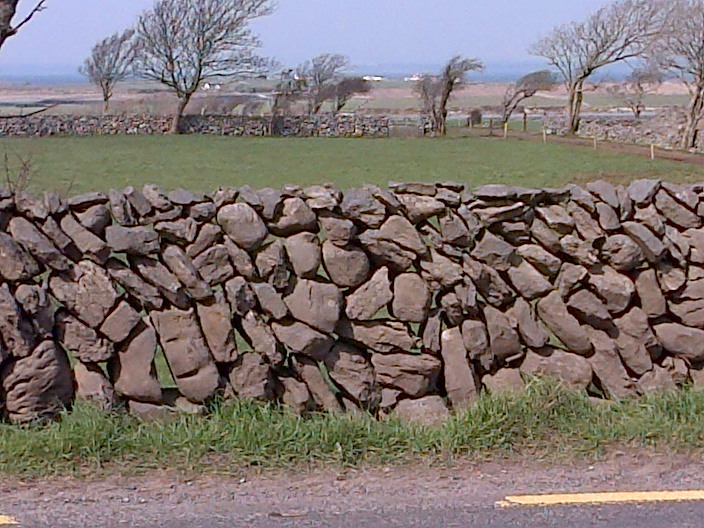 Here is another Irish wall just a few miles away. This looks more like the challenge we have to deal with in the Ardèche. There is no stone of the same size and shape. 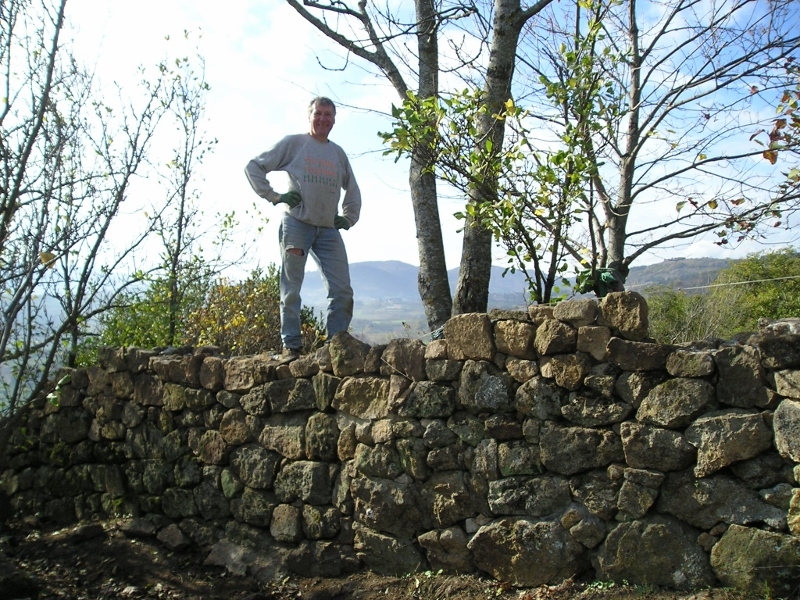 In the Ardèche we may do things upside down, but I believe we are still the best stone wall builders. Here is an example just below the church in Arlebosc. Learned anything? I am not sure. It is also very satisfying to know that, after many years of good service, the sleepers have been recycled so close to their original place of use on the Lamastre railway line and that from next summer the line will be operating again, following a full upgrade. 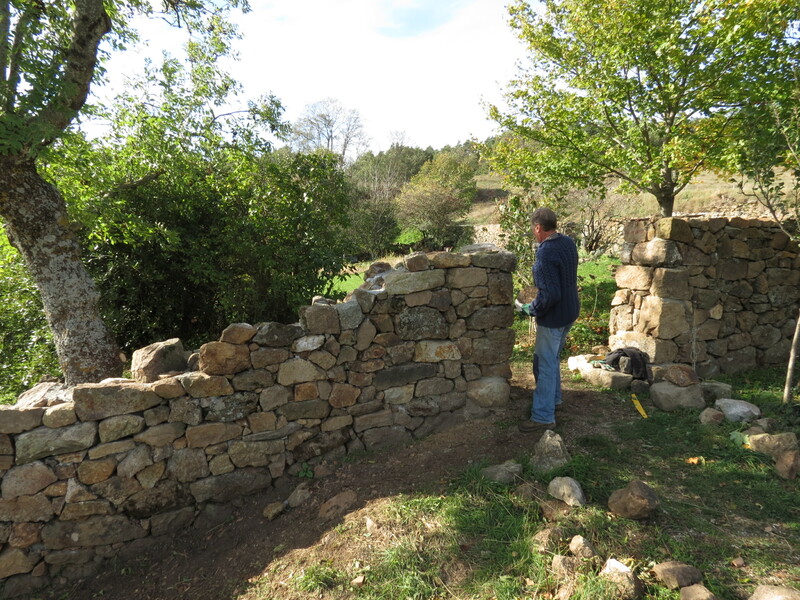 To continue the garden upgrade, Markus has almost completed the second section of the wall he started last autumn. 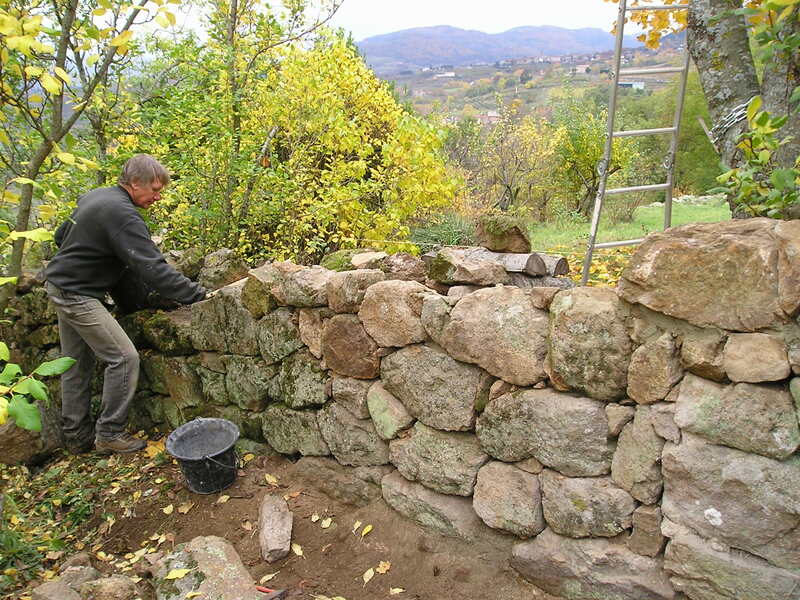 This part involves a steep slope and a corner so he has been working with massive stones. Once again, although it is a job which progresses slowly, he finds it immensely satisfying and it certainly does look pretty amazing. There is still a barbecue spot to be created, the flower bed to be renovated and a whole right hand side wall to be built, which will no doubt be the next big job, but we are very pleased with progress so far. A friend who saw the terrace for the first time exclaimed that we now have une véritable esplanade, which sounds to us a little like the sea front at Brighton, but no doubt has just the right ring in French! The lower garden has had its face seriously rearranged! 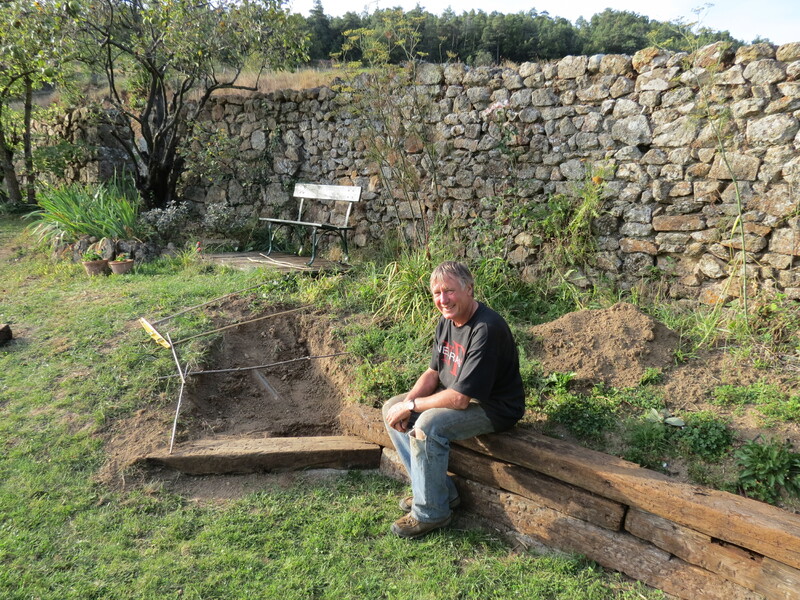 In a few hours’ skilful work with the digger our neighbour Pascal has created a splendid terrace around the shade tree for us. This was always the spot with the most beautiful view but when we originally shaped the garden (just the two of us using spades and shovels), we really did not make the level surface broad enough. 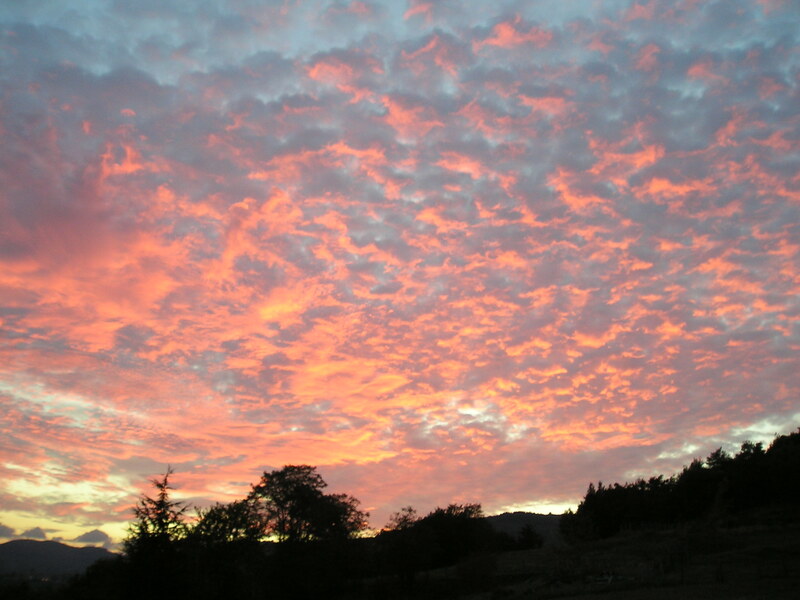 The result was that we always had the feeling that our guests needed to be lined up in rows to watch the sunset whilst sipping an apéritif or enjoying a barbecue. It is the way of these things that time goes by, the tree grows bigger and somehow you never get round to making the changes. 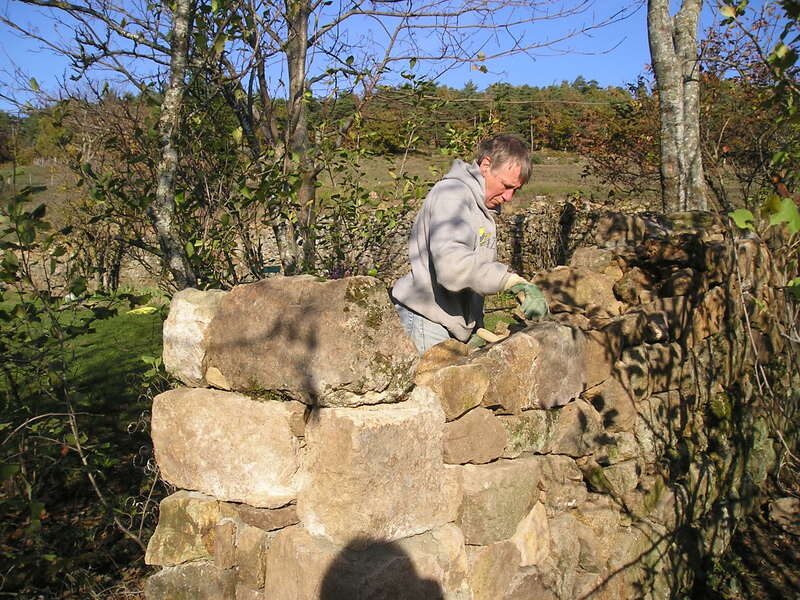 Then suddenly this autumn Markus attacked the rebuilding of the left hand garden wall, which had more or less collapsed. This is a painstaking and very heavy job but once he has got the bit between his teeth he really enjoys it. He treats it like a soduku, or perhaps a rubick’s cube, and takes pride in finding the perfect stone every time. He has also become pretty adept as a stone cutter over the years, and knows the different types, grains and density of the local rocks. We are fortunate to have a pretty good supply from two collapsed walls running down either side of our field and we got an unexpected bonus when a friend, who had locked herself out of her house one afternoon, made us a present of a whole load of beautiful stones as a thank you for breaking into her house for her! 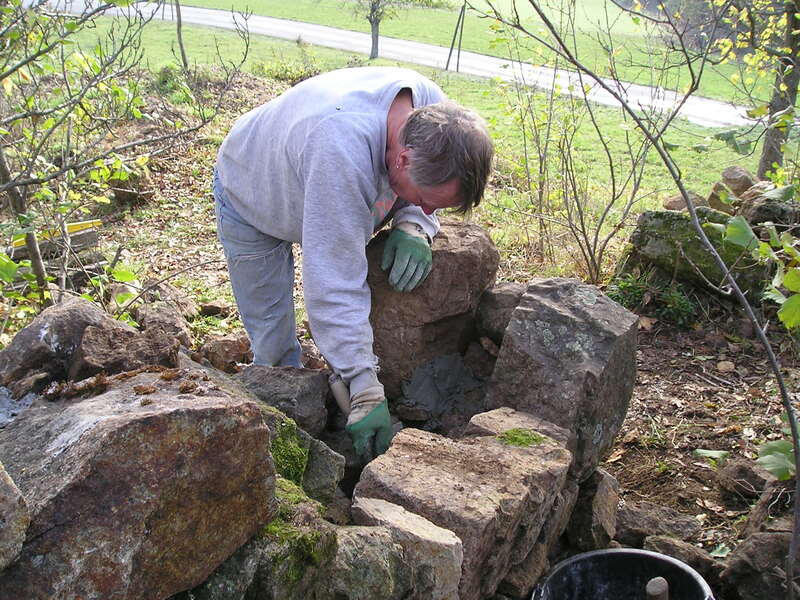 Kate was employed as stonemason’s mate, unearthing and sorting medium sized stones, and being in charge of the filling in phase, once the two outer skins of the wall had been built. 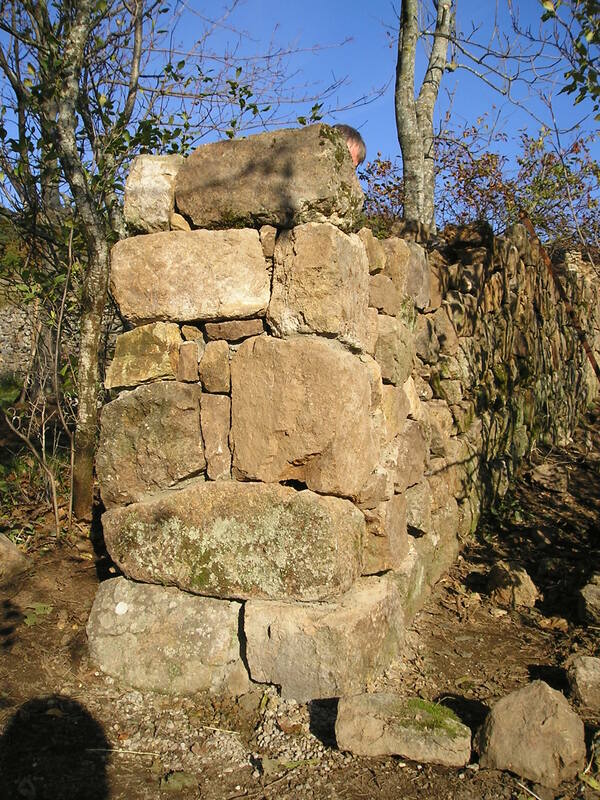 This is basically a dry stone walling technique, used locally for all construction in the past, from vineyard terraces to massive barns. The central part of the wall frequently has a little sand and lime mortar in places but nothing more. 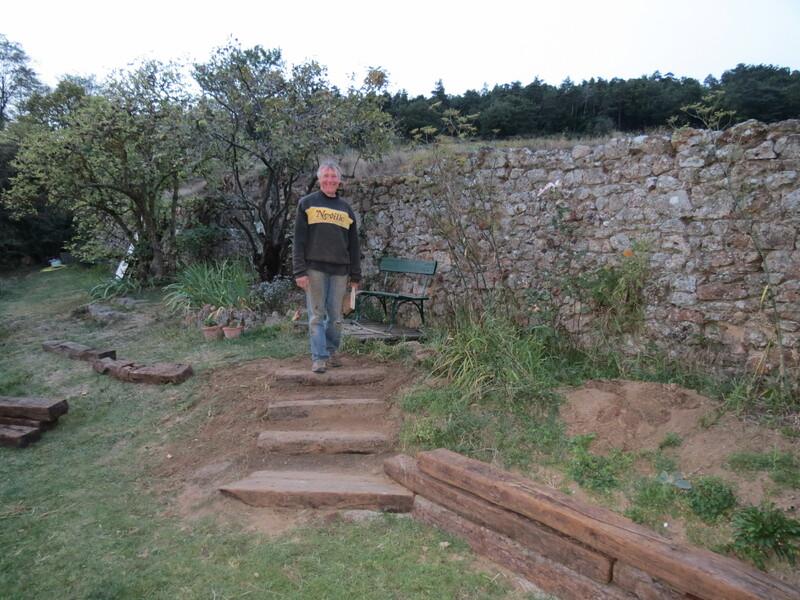 We still need to build the second section, after the side entrance to the garden, but we were sufficiently pleased with ourselves to call up Pascal and get him to come down with the digger. Things are looking a bit bare and shell-shocked at the moment, but we will be sowing grass this week and it will soon green up. We are a little anxious that the tree might up and die in protest at having had sizeable chunks of its roots removed, but we are completely delighted with the reorganisation of the space. As they say, we only regret that we did not get on with it years ago.